Satin crepe de chine tie neck dress and chequered over jacket by Anne Tyrrell at John Marks. Suede shoes by Mondaine. When it comes to dressing up tonight there’s no such thing as a party line. Redheads come into their own with sleek Garboesque hairdos to set off shiny battledress tops and trousers. Jazzily printed crepe de chine dresses and jackets mix with jersey and velvet, softly innocent or dangerously backless and halternecked. Diamante remains the vital accessory – shining in the hair as well as sprinkled on bodices. The choice is yours and glamour the mood. Liberty print cotton blouses and skirts, both by Courchevel. Choker by Ken Lane. Suede bar shoes by Russell & Bromley. Pleated cotton voile horseman print dress by Thea Porter. Gilt and mock turquoise belt by Ken Lane. Left: Dress by Reflections at Reldan. 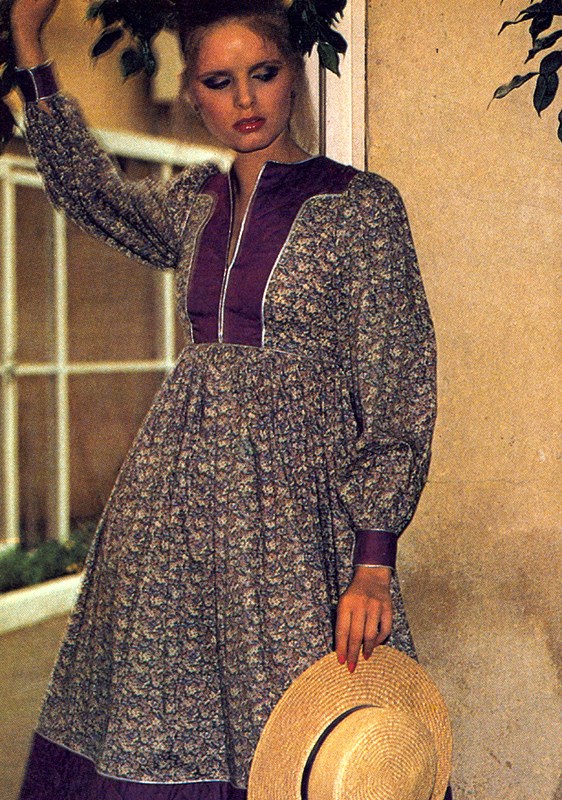 Right: Jersey dress by Baltrik. Left: Ban-lon halterneck dress by Wallis. Right: Brown crepe de chine dress by Annacat. Black jersey dress by Polly Peck. Inset: Jersey dress by Baltrik. Shoes by Russell & Bromley. Black satin battledress jacket and trousers by Juliet Dunn. Grey and red short wooly jackets by Elgee. Fringed black shawl from Emmerton and Lambert. Grey wool flannel full length cape by Christopher McDonnell for Marrian-McDonnell. Dress by Gordon Luke Clarke. Shoes by Piccini. Photographed by Graham Hughes at Syon Park. Both dresses by Maureen Baker. Dress by Maureen Baker. Shoes at Simpson. Liberty print dress by Juliet Dunn.